WALK INTO THIS BIG SKY, MONTANA, home at a certain time of year, and the colors of gray, white, amber, and red reach out to you, echoing the winter palette outside, resonating with the sweep of the snow-capped Spanish Peaks and rounded Yellow Mountain, bordered by willows. The lines are clean: from the glistening cable railing to the stainless-steel countertop, from a red-flamed chrome fireplace to the gray polished concrete floor (warmed with radiant heat) that stretches from the front door to the wall of windows. All of it is accented by exposed fir timbers and cabinets, as well as by touches of red in bolsters and African prints. 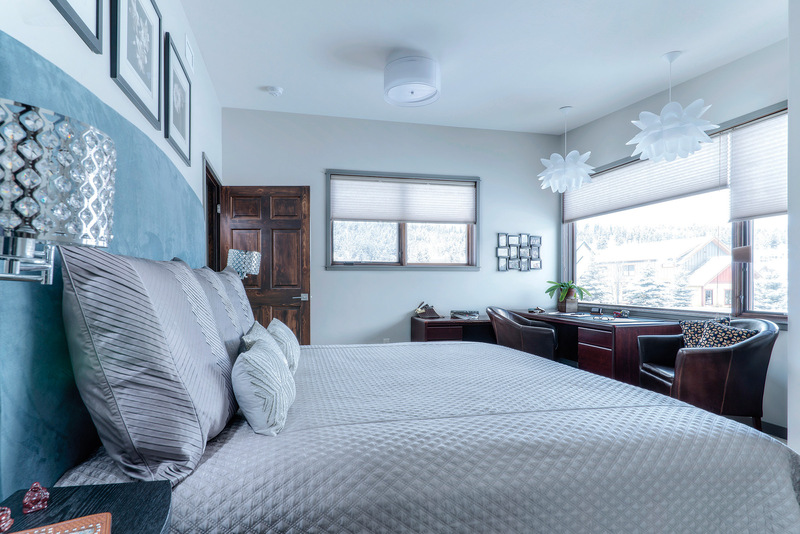 It’s the Limber Pine House, an 1,800-square-foot contemporary home designed by Heather Bing of Bing Interiors, built by her parents Doug and JoDean Bing of Blue Ribbon Builders, and named for the street on which it sits. It’s Big Sky, but with a small footprint. 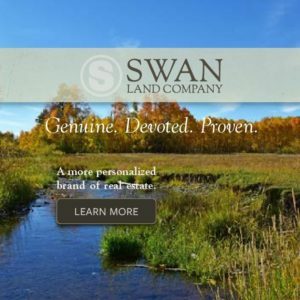 Doug and JoDean have been building custom homes in Big Sky for more than 40 years. 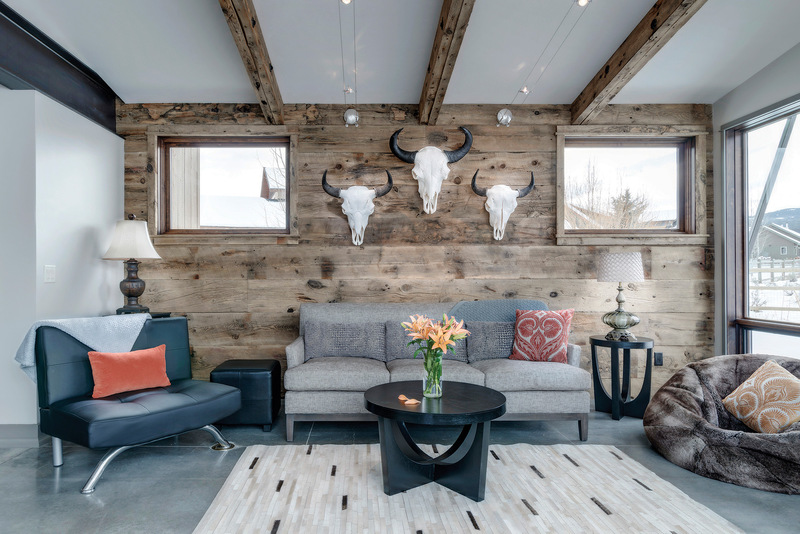 Their portfolio includes spectacular mountain contemporary homes such as the Big Sky Retreat (BSJ Home 2016), an elegant, ski-in, ski-out Moonlight Basin home built of shiplap cedar with stone walls, vaulted ceilings, and a 3,500-pound hearthstone. Constructing a home for their daughter, Heather, however, was a new experience. Heather returned to Big Sky in 2014, after receiving her degree in interior design from Texas Christian University and working for the Peace Corps in Rwanda. She was looking for a small house to buy in Big Sky — a rare commodity — when her realtor sat her down with her parents and suggested that, instead, they build one. Heather and her folks found an unusual lot in the South Fork subdivision. Island-shaped, 12,233-square-feet, with a long driveway, the lot faces the back yards of the other houses in the development. It also has northern exposure that affords spectacular views of the 11,000-foot Spanish Peaks. Doug considered the walking distance to the Big Sky business district, access to the trail system, and other criteria that would affect the cost of building, such as terrain, soil, and road and utility access. Three principles guided the schematic stage, noted Heather. She wanted a house with a small footprint, one that was energy efficient and within the parameters of their budget. She sited the house on the back of the lot to take advantage of the northern views. After marking out the footprint, she set about creating an 1,800-square-foot house with an open floor plan, three bedrooms, three bathrooms, a two-car garage, and large expanses of glass to take in the mountain views. Heather was able to carve out more living space by cutting down on circulation spaces, such as hallways. On the ground floor, she created an open floor plan but used a glassed-in gas fireplace to separate the kitchen, dining nook, and living room. She chose to spend a larger portion of her budget making the house energy efficient: installing a geothermal ground source heat loop for radiant floor heating, and insulating the ceiling with 24 inches of fiberglass to keep out the below-zero chill of a Big Sky winter. Most of the redlining, Doug said, came at the schematic stage, and were decisions based on cost and material choices. Doug, after all, has extensive experience working with construction budgets. 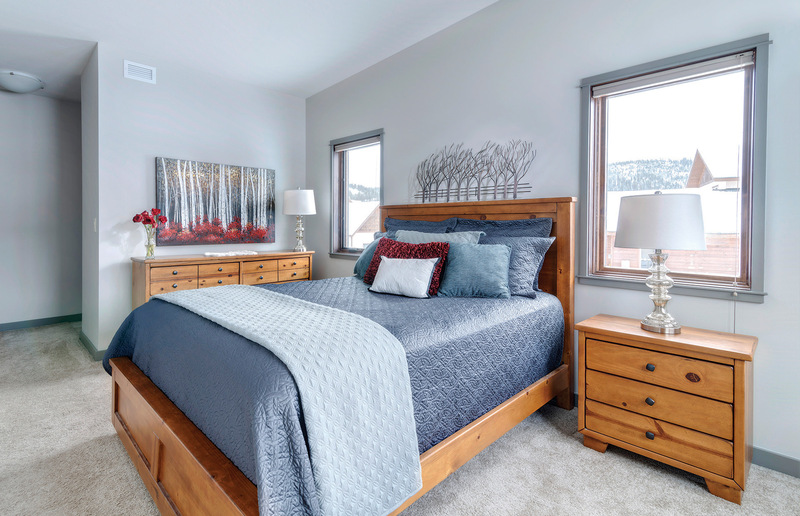 Blue Ribbon Builders broke ground in August, 2014; eight months later, Heather moved in. During that time, while developing the schematics, the design, and the construction documents, Heather and her father worked together. The two made many decisions in the construction phase that focused on material choices. For the exterior, for example, they decided to hold down costs by using cement board siding, which is durable and low-maintenance, and reclaimed old steel roofing. For the interior, Heather controlled costs in creative ways. 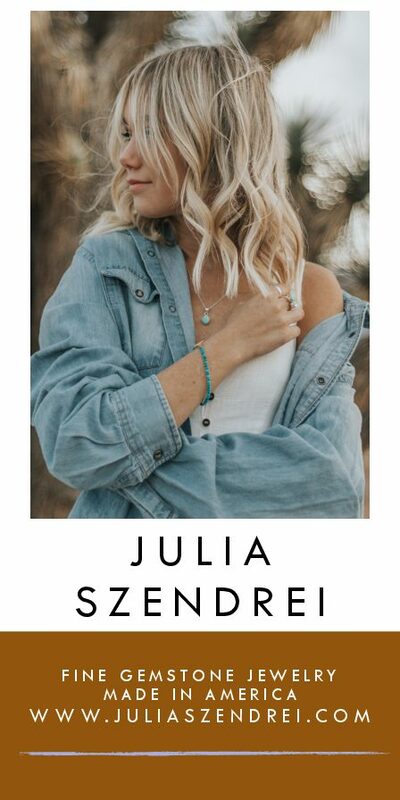 While her original design called for steel beams, she used recycled beams from a bridge that once spanned the Gallatin River; reclaimed wood from the same bridge forms her kitchen table and wall paneling. 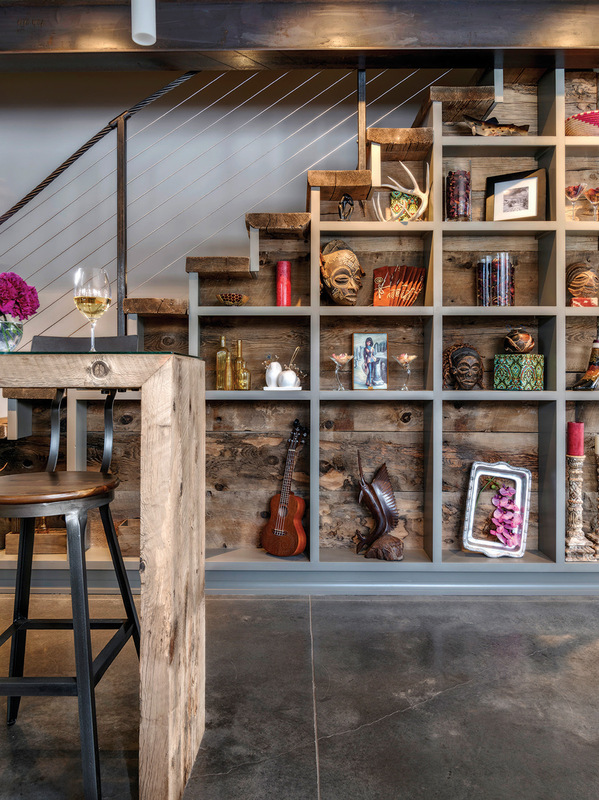 The twisted steel railing along the floating staircase is a repurposed ski cable they found in a junkyard. 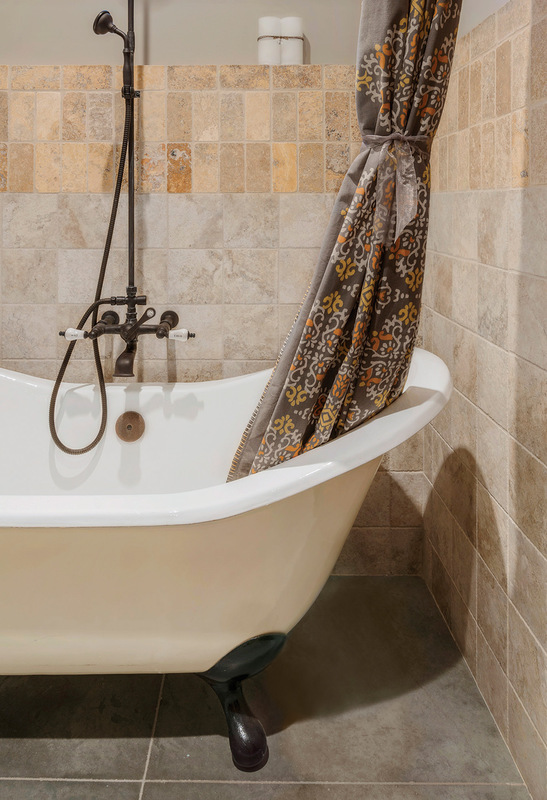 Her oak bathroom sink stand is an antique from her grandmother’s cabin. The African masks hanging on the wall are from her years in Rwanda. At each step of the way, family members pitched in to help. Her Uncle Guy installed all of the Sheetrock in the interior. Her father helped her add that 24 inches of insulation, a painful process involving sharp glass fibers and late nights. Her brother built her dining room table. Heather was her own cleanup crew. She salvaged, power-washed, and graded the bridge timbers, and did all her own painting. Her boyfriend, Robby, helped with installation and landscape design. The lessons that she learned building and designing her own house will serve her well in her new venture: architecture school. In her master’s program, she studies topics ranging from designing sustainable office buildings to non-denominational religious architecture. “We had a few head knocks,” JoDean said, describing the intensity of late nights designing, and later putting up insulation. She noted that when the house was finished, Heather wanted to stop. JoDean insisted that Heather landscape the yard to highlight the beauty of the house. Again, the family rolled up their sleeves and helped, planting a perimeter hedge and trees, and designing beds filled with hardy plants, pine cones, and washed rock. From the rocks unearthed during construction, the family created a stone creek. Polished cement floors, recycled bridge timbers, bright red pillows, and an inviting fire accentuate the color and sweep of the Big Sky landscape. Windows of stained walnut with a glossy gray trim frame the Montana landscape. Bathroom tiles echo the palette used throughout the house. A vision in blue, the bedroom features petal lights assembled by the homeowner. 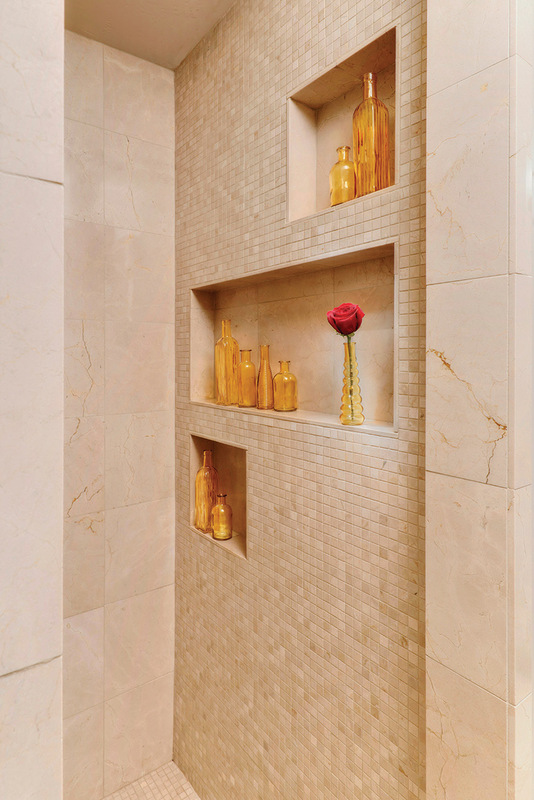 Recessed nooks in the shower offer built-in convenience. 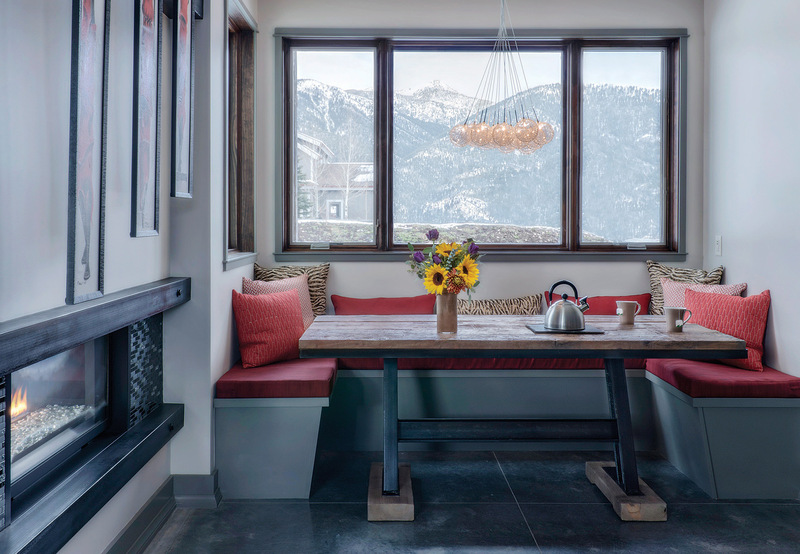 Space-saving and cozy, a kitchen nook overlooking the Spanish Peaks features a table built by the homeowner’s brother. Bookshelves built from recycled timber store treasures under the floating staircase. 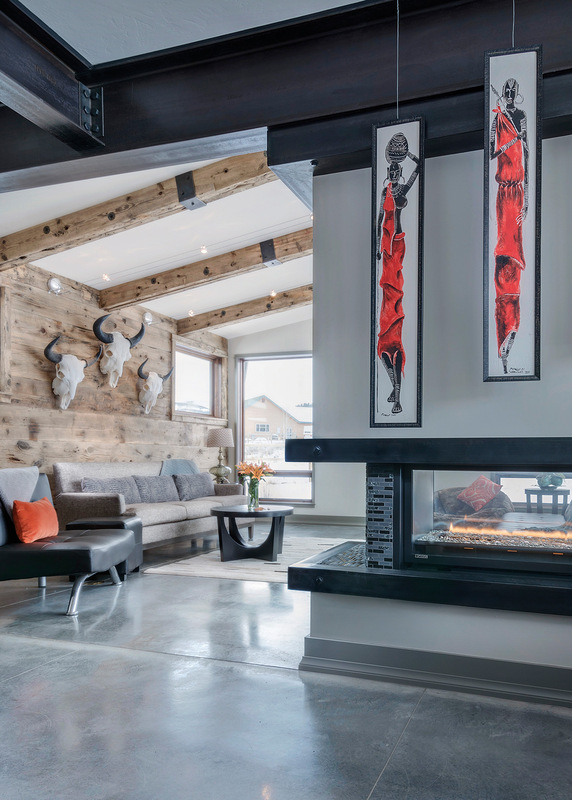 Interior siding, made from the reclaimed wood of a former bridge over the Gallatin River, is accented with buffalo skulls. 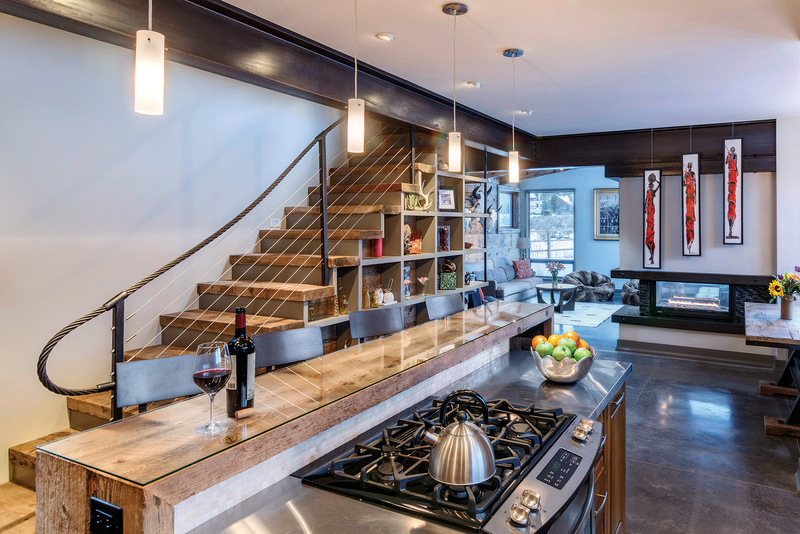 The clean lines of the open floor plan are accentuated by the railing of the floating staircase, made from a repurposed ski cable.